By definition, synthetic is a manmade object designed to imitate or replicate some other object. Essentially we can do the same thing in the futures markets by creating trading vehicle through a combination of futures and options to replicate another trading instrument. But it gets even better. As the creator of the vehicle we can customize it to better suit our needs as well as design it to better take advantage of the underlying market. The delta value of any given trading vehicle can be roughly described as the how much money is made or lost with a 1-point move in the futures market. A futures contract has a delta of 1. In other words, for every point the futures market moves your position will make or lose the amount of that particular multiplier. When speaking about a few points, the dollar amount might not seem significant, but when you are talking about swiftly moving markets you can see how so many futures traders are unsuccessful. The same volatility that makes large profits possible is the same volatility that makes trading futures contracts too much for many to handle. Lowering the delta of a trade is often a good idea in that it essentially lowers the immediate risk of loss. However, it also lowers the pace of gains should you be right. Through the creation of a synthetic position you can actually decrease your delta as well as, in my opinion, increase the odds of success. Let's take a look at two of the most commonly used of the synthetic positions. 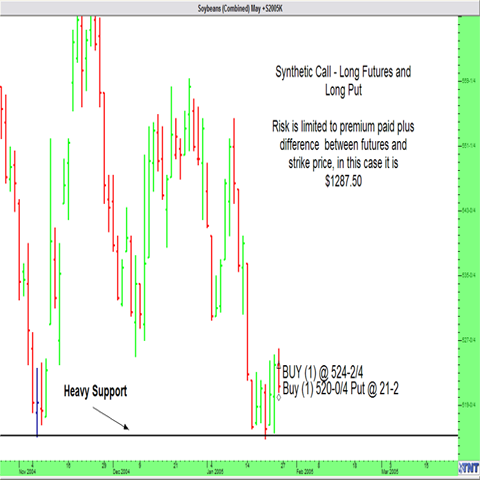 When to use a Synthetic Long Call Option in the Commodity Markets? What is the Risk of a Synthetic Call Option Strategy? This trade involves limited risk. However, it is possible to incur a “cash call” should losses on the futures contract exceed the available cash in the account. This is similar to a margin call, and would require liquidation or additional funding within three days. Commodity Traders typically use this strategy as a means of increasing the flexibility of a position. Although the payout of a synthetic long call option is theoretically identical to that of a call option, the ability to leg out of the trade can be a huge advantage. This approach works best in markets in which option premium is low, but keep in mind that markets are dynamic and those that are viable candidates for this strategy change quickly. A trader looking to position himself ahead of the seasonal spring rally in the grains may look to go long a futures contract and simultaneously purchase a protective at-the-money put option. Doing so allows traders to participate in the futures market without the inconvenience of lost sleep and excessive stress. In 2005 a trader may have been able to purchase a May 520 put near the end of January for about 25 cents, or $1250 ($50 x 25) and go long a futures contract from $5.20 per bushel. This creates a scenario in which they would make a profit anywhere above $5.45 (520 + 25) before considering commission, or about $5.46 ½ assuming a $40 transaction cost for each leg of the trade. If you are a bean trader, you know that 546 1/2 cents per bushel for May soybeans is definitely possible; in fact we haven't seen prices that low in quite some time. In the event of a market drop after the trade is initiated, a trader could opt to take profits on the long put and continue holding the long futures contract. This is of course a form of “double dipping” and considered to be aggressive. Nonetheless, the ability is there and can be a valuable tool if timed correctly.